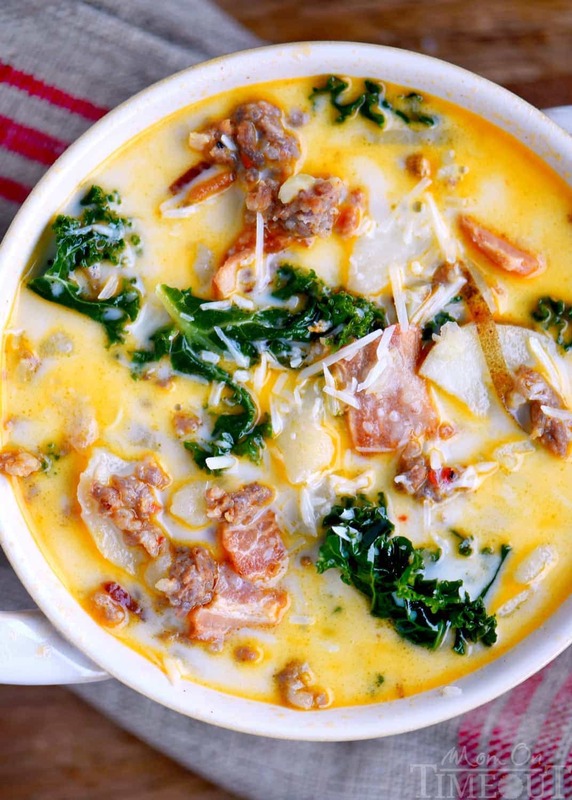 The whole family will love this copycat One Pot Olive Garden Zuppa Toscana Soup! 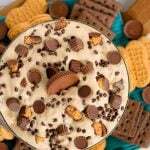 Comfort food at it’s best! Loaded with bacon, sausage, potatoes, and kale! So delicious and filling! 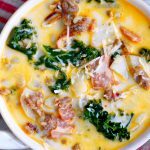 Back in November of 2011, I shared the recipe for my favorite soup ever, Olive Garden’s Zuppa Toscana soup. 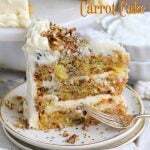 It went bananas and has since been one of the most popular recipes on my site. 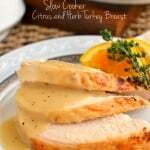 It’s a recipe that I make at least once a month and more like once a week during the winter. My whole family loves it and you guys do too! After numerous requests, I shared a slow cooker version of the soup in 2014. That version has also been insanely popular and well-loved by my readers. Here we are in 2017, and I am now sharing a one pot version that makes this soup so simple and easy, you’re going to make it more than ever. 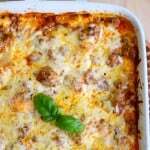 Instead of baking the bacon and browning the sausage in the oven, everything is done in one pot. I used my new dutch oven that my Dad got me for Christmas! 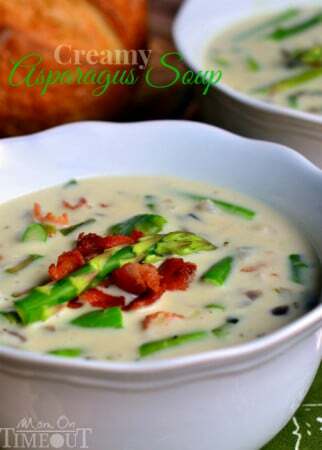 I love how all the drippings from the sausage and bacon add so much flavor to the soup! It’s fantastic! I also doubled the amount of kale. For some reason, my boys think this is the best part of the soup… Who am I to argue? I love buying the pre-chopped kale to make things easy. I also use a mandoline for slicing the potatoes. It takes about one minute to have them all perfectly and uniformly sliced. I add a bit of crushed red pepper flakes to the soup as well as a bit of salt and pepper. Totally optional. The soup already has a lot of salt from the bacon and heat from the spicy Italian sausage so feel free to omit if you’d like. 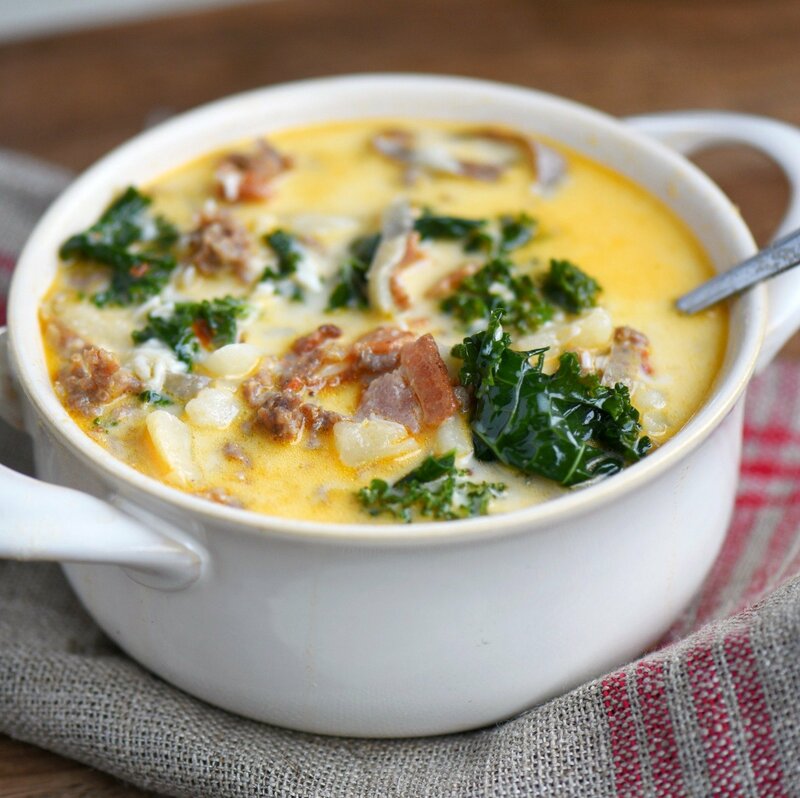 The whole family will love this copycat One Pot Olive Garden Zuppa Toscana Soup! 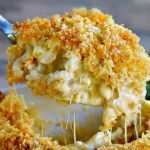 Comfort food at it’s best! 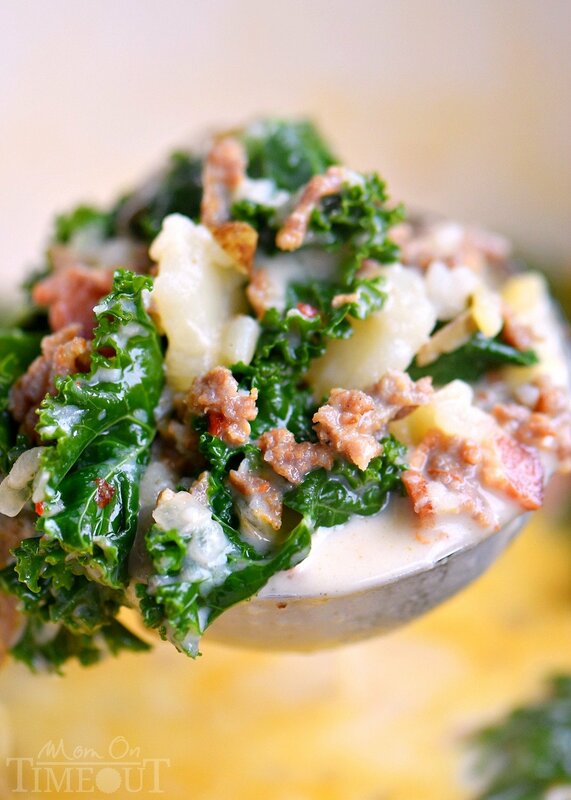 Loaded with bacon, sausage, potatoes, and kale! So delicious and filling! Brown sausage in a large pot or dutch oven. Remove sausage with a slotted spoon and set aside. Add bacon to pot and cook until crispy. Stir in chopped onion. Cook for 5 to 6 minutes or until onion is translucent. Stir in minced garlic and cook for 1 minute, stirring frequently. Add chicken broth and water to the pot. Add crushed red pepper flakes, salt, and pepper if desired. Add thinly sliced potatoes (I use a mandoline) and the cooked sausage to the pot and bring to a simmer over medium heat. Continue cooking until potatoes are tender, about 10 minutes. Add the kale to the soup, and simmer for an additional 5 to 10 minutes, stirring occasionally. Stir in the heavy cream and let heat through. 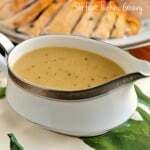 Ladle soup into bowls and serve with Parmesan cheese. WOW I am so so happy with how this turned out, thank you so much for such a great recipe!! Definitely will be making this very often come fall and winter. Yay! So glad you enjoyed the soup Shelby! 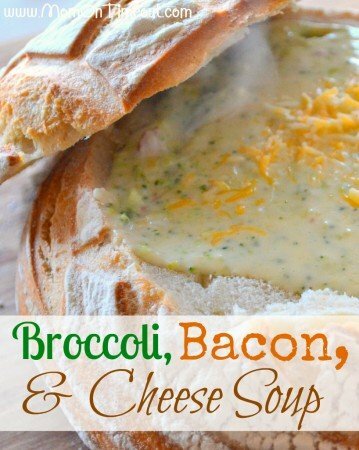 I make a similar version of this soup and we love it so much. If you’re in a real hurry or don’t wan’t to bother with slicing potatoes, you can use frozen southern style cubed hashbrowns. I’m so glad your son enjoyed the recipe! Great idea with the ground chicken 🙂 Thanks Beatrize! I`m from Italy and this dish remainding me of home. Even if I`m Italian I never tasted dish recipe. Can`t wait to make it. I will come back with feedback. 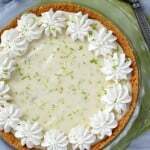 Just made this according to the recipe. Yummy but I hate mushy bacon so at the end I picked the pieces out. Still has the flavor of it tho. 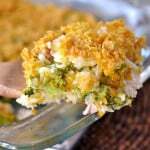 When I served it I just had a few piece of cooked bacon I crumbled and added to my bowl! Just would like to know if this can be made in the Instapot? Yes it can and I’m actually working on the recipe this next week. Basically you need to set it to saute for to cook the bacon and sausage and then you will cancel the saute setting. Set knob to sealing, set to manual, 5 minutes at high pressure. Allow for the 10 minute natural pressure release, open the lid and stir in the kale, close the lid, let the kale soften – about 5 minutes or so, and then stir in the cream. Hope that helps! I substituted radishes for the potatoes to make it low carb, but kept everything else the same. It was delicious!! Thank you!! I don’t usually like to leave comments, but felt I had to this time. 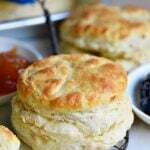 This recipe was everything you said and more. 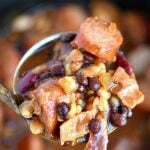 One pot – super easy and…Oh My Goodness…its delicious. 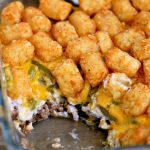 Generally I hate copy cat recipes, mostly because they just don’t seem to be able to pull off the flavor of the original, however, you nailed it. As a matter of fact, I think this might actually be better than OG’s. Wow! Thank you so much for this. If you ever feel inclined to make Noodles and Company’s Tomato Bisque and post it…I’m on it! SO glad you enjoyed the soup Roberta! We love it so much! 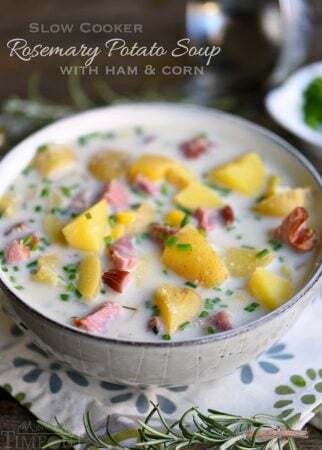 My meat and potato family loved this soup. Thank you for sharing! So glad you enjoyed it Sandi! I can`t believe the taste of this soup. My son who by the way hates everything he simply loves this soup. Is the only dish he doesn’t have trouble eating :). Thank you! That’s fantastic Maria! My boys love it so much too!